In this article, we round up a few of the best cat houses on the market and highlight their features. But why would you consider purchasing a cat house for your feline friends? Well, there are a number of reasons, and we’ll look at these first. Perhaps you own outdoor cats – that’s those that spend the majority of their time outside, whether through choice or because you don’t like them being in the house. Alternatively, you may play host to feral cats which have resisted all attempts at being tamed. Despite their fur coats, cats suffer from cold and extremes of weather just like we do, and need a place to shelter out of the inclement weather conditions or even strong sunlight. Many other cats just like a bit of peace and quiet and like a safe place, somewhere they can retreat to away from the hustle and bustle if things get too much, to rest in peace and quiet. Indoor cats – ones that live inside and aren’t allowed outdoors – also have specific needs. Alongside their own hidey hole, owners should also provide additional physical and mental stimulation. Exercise is very important to prevent feline obesity, which is on the rise and can cause serious health consequences including diabetes and arthritis. An opportunity to play frequently is vital too. Cats are hunters by nature, and indoor cats especially can get bored and cause mischief. Some of that excess energy can be burnt off or diverted by giving them a cat playhouse of their own. Having considered all these factors, we’ll now take a look at some of the houses that can offer benefits like this and more. 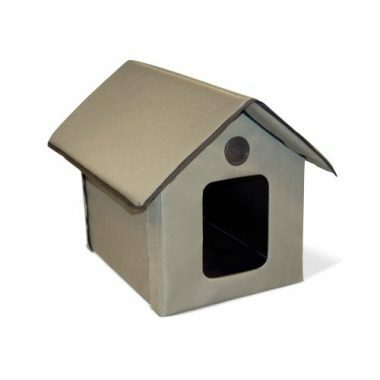 The K&H Pet Products Outdoor Kitty House promises water and weather resistance for protecting your cats from the elements while they are outdoors. The peaked roof overhangs the walls of the cat house so that rain will run off and drip down without damaging the sides or getting your cat wet. The material used in its construction is 600 denier polyester, making it water-resistant and also insulates and cuts out drafts so your cat will stay warmer in winter while outdoors. The cat house has two door flaps, meaning your cat can come and go as he pleases without being trapped inside by predators. The whole cat house requires some self-assembly, but is easy to put together with hook and loop fasteners to attach the walls, a zipper to affix the roof and Velcro to fit the clear plastic flaps for the doors. If you buy the heated version, the heat is supplied through a removable floor pad, so can be taken out in summer months if required. The pad itself nestles within the house when in place to protect it from the elements. The cover for the heat pad is removable for easy washing when it becomes dirty and matted with fur, and the pad itself can be wiped clean if necessary with a microfiber cloth. 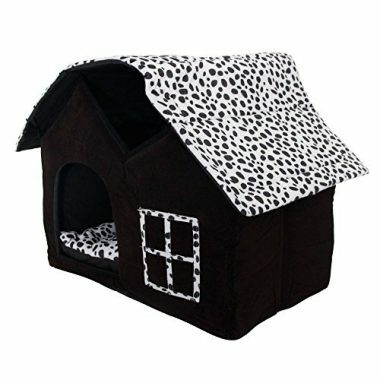 The exterior of the kitty house made of wipe clean vinyl – just a dampened cloth is all that’s usually needed to remove dirt and grime. The product comes with a one year guarantee. 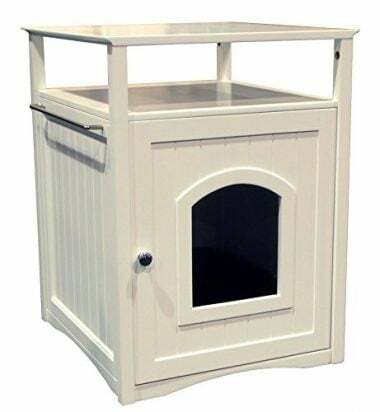 Buy this Merry Products Pet House, and you’re getting a handy piece of furniture for the home as well as a pet house for your cat. It doubles up as a nightstand if your cat loves sleeping close to you, but looks good enough to be positioned in any living space in your house! Designed to take a maximum weight of 50lbs, the pet house is sturdy enough to take on anything from a bedside light to a printer, if placed in your study area. The cabinet is large enough for you to place your cat’s litter tray in the bottom so it’s out of sight – the base will take a pan of up to 16” x 18.5” (not included) and should contain a lot of the litter kicked around by even the most enthusiastic of cats. Alternatively, you can add a cat bed, cushion or blankets on the base for your cat to sleep on. The door is 8” x 7” and features a cut-out large enough for the cat to enter and exit, or can be opened wide to offer access for easy cleaning. It stays securely closed with a magnetized catch. There is a shelf above the door and a towel bar which can be fitted if required. The unit is self-assembly, but comes with full instructions. The nightstand/ pet house is fully finished all round – in other words, the furniture piece is presentable from any angle, so great if you want to position the opening to the side, for instance. One of the larger models in our selection, the K&H Pet Products Outdoor Multi-Kitty A-Frame is suitable for up to four cats at a time. 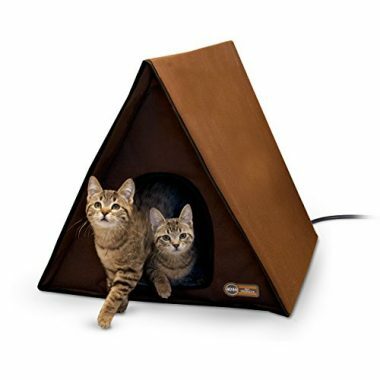 The tent-shaped shelter is made to withstand outdoor use, although of course it can be used indoors if your cat is a home dweller. The house is fitted together through hook and loop fasteners, so it’s quick and easy to assemble and no tools are required. There are detachable clear plastic flaps for the openings to keep out drafts while allowing your cat to view the world outside – these are easily affixed and removed when needed with Velcro. The product features two exits to reduce the chances of your cat being trapped inside by dogs or other predators. The A-Frame is constructed from waterproof fabric and has an overhanging roof to protect from dripping rain. Some owners report that the product is relatively light, so is best kept in a sheltered position out of the wind – which you would do in any case to protect your cats from the elements. Heated options are supplied with a medium K&H Lectro-Soft Outdoor Heated Bed pad, which is MET safety listed. The pad is designed to keep your cat warm to a body temperature of around 102oF when the animal is lying on it. The heat pad’s cover is made of a fleecy material for comfort and is machine washable (on delicate or gentle cycle), but it’s recommended that you line dry the cover rather than tumble dry it. The exterior of the house can be spot cleaned with a dampened cloth or sponge. A one year limited warranty applies to this product. 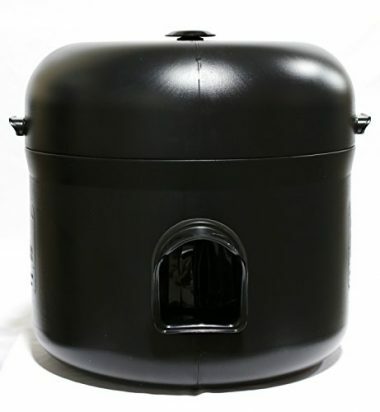 The Kitty Tube Gen 3 Outdoor Insulated Cat House is designed to accommodate up to three cats at a time, making it great for households that either own outdoor cat or harbor families of feral cats. The special, custom pet pillow is designed to fit snugly within the tube and is machine washable. For feral cats, there is a straw option available. Because the product is specifically for outdoor use, the walls, floor and roof are all insulated to keep your cats warm in winter. The flap door is removable and clear so your cat can see the world going on outside while indoors. The lifting handles allow the tube to be easily moved around your yard or garden until you find the best position for it. All handles and openings are recessed with an overlap to prevent rain from leaking in, and also come with adjustable flaps so you can close them off in winter, preventing drafts, or open them up in summer for a through-draft. The top is also removable for access to the interior when you want to clean it; and additionally has a vent cap which will allow air to circulate, preventing the inside from developing condensation. All surfaces are smooth and waterproof, and can be washed down with the garden hose or with a sponge and warm water. The bottom is elevated a small amount from the floor to prevent cold from the ground from seeping up and also to provide drainage when necessary. This Kitty Tube only features one exit; no escape door. The manufacturer explains that the door is designed solely for cats, so predators such as dogs and coyotes are unable to get even their heads through the opening. The design has been approved by Alley Cat Allies and Feral Fixers, two national organizations who work for the welfare of feral cats. The tube comes with a lifetime guarantee against chipping, cracking and fading. The Curious Cat Cube from MidWest is for indoor use. It has a large doorway – 10” by 8” – allowing even the largest breed of cat to enter the cube and relax in privacy inside. 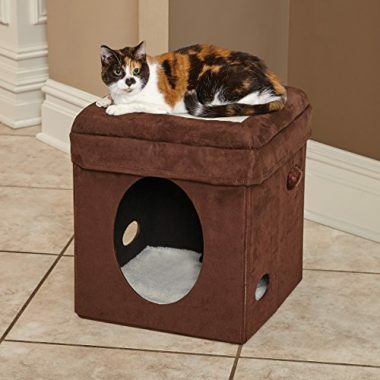 The removable lid is comfortably cushioned with raised, bolstered sides, and strong enough to withstand the weight of a sleeping cat, if your pet likes sleeping off the floor in an elevated position. The interior base is also padded for comfy sleeping. There are small, circular cut-outs on two sides to allow your feline to play peek-a-boo or view what’s going on around them. A hanging ball covered in matching plush is also included – this can be easily affixed anywhere on the cube for your cat to play with. The product includes a one year warranty from the manufacturer. 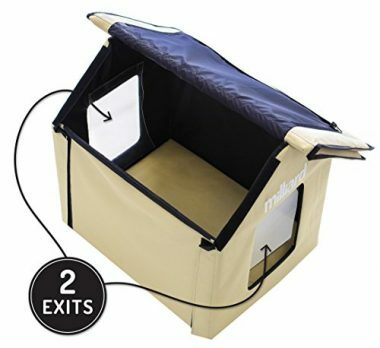 The Milliard Portable Outdoor Pet House has room for two small cats or one larger one. The tent-shaped roof which overhangs the door, sides and other opening is ideal for allowing rainwater to run off. The whole product is constructed from nylon canvas, which is waterproof and insulates against the cold. Self-assembly is a breeze. The roof is fastened with a zipper, while the walls and doors feature Velcro, so you won’t need to get your toolkit out to put this together. There are two doors which have detachable plastic flaps, allowing them to be removed if your cat doesn’t like to be penned in or to let breeze through in the summer months. The door flaps are clear so your pet can have a view of what’s going on outside. In the unheated version, there is a removable foam pad for your cat to sleep on, preventing cold seeping up from the floor. If you choose the heated version, the heat pad comes in a vinyl cover, protecting it from the elements. This is encased in a fleece and fur cover for your cat’s comfort. The electrical cord is six feet long and is safety tested. The heat pad itself is low wattage, providing enough heat to keep the animal warm without greatly increasing your heating bills. The whole product is hand washable or can be spot cleaned with a damp cloth, while the removable pad in the interior is machine washable. 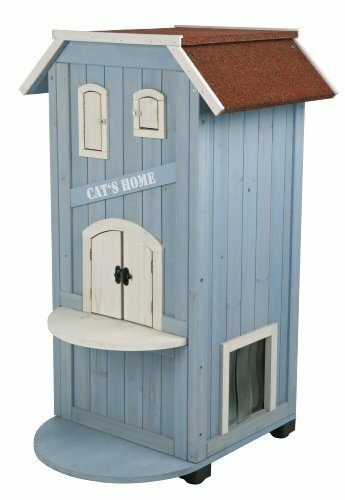 This Three Storey Wooden Cat House comes from TRIXIE’s range of cat homes and enclosures. As the name suggests, the house has three levels with doors at the front (on the second level) and side (on the first level), allowing cats to come and go as they please and adding the fun of jumping to the mix! The front entrance is also shelved so a cat can sleep or sit in the sun. There’s also a large hinged door at the back, which is designed to make access easy for pet owners when they want to clean inside. As well as the doors, there are also peek-a-boo holes with hinged shutters so you and your cat can play hide and seek. The interior has a wooden base and two staggered shelves on the second and third storey which offer resting places for your cat or places to put food, for instance. The side door has three slatted plastic flaps which helps the cat enter with ease, but also prevents wind and rain from getting in. The whole unit stands on four hard plastic feet, which raise it off the floor to stop cold and damp from permeating up into areas where your cats sleep or play. There is a flat roof for cats to sit on, but on all sides the roof surface overhangs the walls so rain can run off. The cat house is weatherproofed when it arrives, but if you’re placing it in an area that’s exposed to heavy rain, it’s a good idea to give it a coat of varnish or weather protection yourself from time to time to prolong its life. The wood composite from which the unit is constructed is CARB Phase 2 compliant, meaning formaldehyde emissions are capped. The SKL Luxury High-end Double Pet House is also suitable for small dogs under 5kgs as well as comfortably accommodating up to two cats. As it’s made from soft plush and high density foam, it’s not really suitable for outdoor conditions, but makes an ideal hidey hole and super-comfortable sleeping place for indoor cats. The door opening is around 7.5” x 8.5” and the roof is fixed in place with Velcro, making it easy to assemble. The internal cushion is thick and plump, and can be removed for easy washing, while the whole house can be vacuumed to remove pet hair and spot cleaned with a damp cloth. Customer reviews suggest it’s not sturdy enough to take the weight of a cat on the roof, which is in any case pitched, so if your pet is one that likes an aerial view, it may not be suitable choice. However, if the roof does come off, it’s easy to put it back on. The product comes flat packed, but is easy to erect without tools. The broad options when looking for cat houses are indoor or outdoor; and heated or unheated. The first is important because if you are placing the cat house outdoors, you need to know that it is draft proof, waterproof and sturdy enough to resist strong winds, so it doesn’t blow away. Heating is often an additional option for outdoor cat houses, as many owners buy these to keep cats warm in winter if they choose not to come into the house. All the cat houses mentioned in this article are ones that offer your pets additional shelter and a place to play or hide from the hustle and bustle. Some owners, though, who have indoor cats are looking for a secure cattery, so that their cats can experience the great outdoors without wandering off, falling victim to predators or putting themselves in danger from passing cars. If this sounds like you, then you’re looking for a cat run or pen instead. Cats that are habitually confined to the indoors need extra stimulation and resources to keep them occupied and happy in their day-to-day lives. If you’re the owner of an indoor cat, you might also like to look for additional accessories such as cat condos and scratching towers. Cat condos usually feature a variety of levels, shelves, toys, and even cat hammocks which will give your cat an indoor play center to keep him occupied and give him somewhere new to chill. Scratching towers are essential around the home as they’ll allow your pet to sharpen their claws, stretch and exercise their muscles, as well as marking their territory, as they would in the great outdoors. They also help save your furniture from damage! Size: while cats seem to love confined spaces, often sneaking themselves into what appear to be impossibly small nooks and crannies around your home, the dimensions of the cat house are still important. 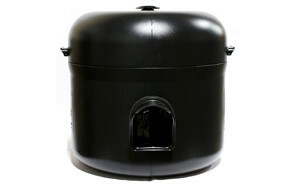 You want one that will allow your cat or cats enough room to get in and out comfortably, and to curl up and sleep. Play Features: As mentioned in the introduction, indoor cats especially need stimulation, so many owners look for a cat house that can double up as an additional play area for your pet as well as somewhere to shelter. If this sounds like you, look for things they can interact with, or at least room inside to put their favorite toys or a scratching tower. Safety: Particularly if your cat house is for the outdoors, it’s important to look for a model that features two doors. This is so your cat cannot be trapped inside by predators. Alternatively, some products restrict the size of the opening to prevent animals larger than a cat from accessing it. Weather Resistance: Outdoor cat houses must at least be shower-resistant if not fully waterproof to offer protection against the elements and to preserve its life. If you live in an area that suffers from extreme winds and are worried about a cat house blowing away, look for a sturdy model made of wood rather than fabric. Are There Any Additional Tips for Outdoor or Feral Cats in Winter? Some cats just won’t come inside, no matter how cold it is. Their fear of contact with humans or being confined is far greater than their own physical comfort. If you’re concerned about any feral or outdoor cats making it through the winter without suffering from hypothermia, then heating is a must. In terms of heating, then, what should you be looking for? Ensure the heater is guarded by a shade or similar, so that the animal cannot burn itself on it. Two heat settings are desirable, a high and a low one. As the winter draws to a close, you should turn the heat down to low to help them adjust as the weather gets warmer. Look for a low wattage heating element or system to keep your bills down. Check the length of the cable to make sure you have a convenient power socket for plugging it into the mains. Once the heating pad is plugged in, you may feel it and wonder whether it’s making any difference. Remember that cats’ bodies are more sensitive than ours and what might not seem much warmer to you is actually perfectly sufficient for your feline friend to feel the benefits. A good way to check whether the heat pad is working it to place a blanket or pillow over it, then around 20 minutes’ later, feel underneath it. This will give you reassurance that the pad is emitting warmth. Other steps you can take to make sure your feral cat is comfortable in the worst of the winter weather include making sure the surface area of their bedding is raised at least three inches off the floor. This helps ensure that the cold and damp doesn’t penetrate upwards through it. If it’s really cold, you can add a blanket or other covering to the outside of the house to insulate it. However, just check that you haven’t blocked the exits if you have a nervous cat. It’s also worth noting here that you should feed outdoor or feral cats a little more in winter than you would usually do during the warmer months. They’ll be expending extra energy on trying to keep warm, so they’ll appreciate the increase in calories. Unplug the heater in summer and prop open or remove the doors if possible when it’s really hot to allow a free flow of air. Q: Where Should I Place My Cat House? 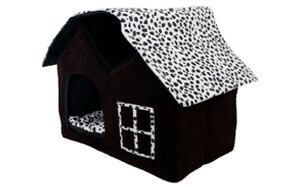 A: This is very much dependent on whether you’ve bought a cat house for the indoors or for outdoor use. Look for somewhere off the beaten track and away from the general run of traffic through the home. One of the benefits of his cat house should be that it’s a quiet place for him to chill and relax, or hide when feeling stressed, so you don’t want it in any area that’s too busy or noisy. If he has a preferred room or likes to be close to you while work or sleep, for instance, then consider placing it here. It could go on your porch, for instance, if you have one; or under decking. If a garage or barn is habitually left open or has access points large enough for cats, then these kinds of locations would be great as they will provide additional protection from the weather. If none of these apply, then anywhere out of the prevailing winds or sheltered from the worst of the rain is good. Q: Is There a Way to Encourage My Cat to Use his Cat House? A: You know what it’s like with an independent minded cat. You spend a fortune on expensive toys or play equipment and they won’t go near it; they’d rather have the cardboard box it came in! If you’ve invested in a cat house and you pet doesn’t seem keen, there are a number of handy hints for encouraging him to have a go. Put a familiar-smelling blanket or his favorite cushion in it. If possible, remove one wall so it’s more open initially, or prop the door open for a little while. This will give him reassurance that he’s not going to be trapped inside. 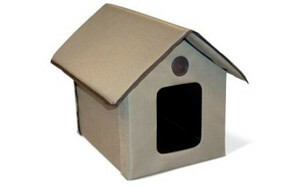 Cats are curious by nature, so you may be able to entice him to explore a bit if the cat house doesn’t look threatening. When he becomes accustomed to wandering in and out at will, you can then think about replacing the flap or closing the door. You could also try enticing him in by sprinkling a little catnip inside, or using his favorite treats to encourage him to enter the cat house. Q: Can I Put my Cat’s Food And Water in the Pet House? A: It’s not advised. For one thing, many of these cat houses aren’t big enough to take bowls as well as the cat. And if you have invested in a heated model, there are often concerns that a bowl of water, if knocked over, will damage the heating pad or worse. Also, despite their reputation for cleanliness, cats aren’t always the most fastidious of eaters. With food in their cat house, you may need to clean it up more regularly or it’s liable to become smelly, attract insects and bacteria, not to mention other animals, especially in winter when food is scarce.